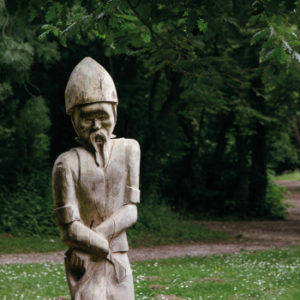 The Keepers of Bryngarw are the mythical guardians of the park’s woodlands, meadows, gardens and river. They are the ancient keepers of the story of the land but they have fallen asleep. The story falls silent and a shadow hangs over the land. To bring Bryngarw to life once more, you must journey through the gardens and woodland, along the river and across the meadows. Using the special Star Talisman, find the Keepers and awaken them at last and listen as their story begins to be told once more… The Keepers is an exciting, unique and interactive interpretation scheme which uses sculpture, music and themes from Welsh mythology to bring the story of Bryngarw’s wildlife and landscape to life. Ask at Cedars Tea Room or the Rangers’ Office in the visitor centre for your magical Star Talisman and map. Then begin your quest by inserting the Star into the central flame of the Circle of the Keepers sculpture at the front of the visitor centre. The Star has six numbers points. You can listen to as many or as few as you choose. Always start with Point 1 at the top. Those who awaken all of the Keepers become a Keeper of the Story themselves and receive a certificate. Please remember to return your Star at the end and don’t forget to collect your certificate once you’ve woken all of the Keepers! This project has received funding through the Rural Development Plan for Wales 2007-2013 which is funded by the Welsh Government and the European Agricultural Fund for Rural Development.